Reciprocal tachycardia - what it is. Reciprocal tachycardia in adults and children, the heart rate on the ECG. Among all arrhythmias with localization in the atria, reciprocal tachycardia is most commonly encountered. The more dangerous this pathology can be said for sure after a thorough and thorough examination of the patient, which is prescribed by the cardiologist or arrhythmologist. Reciprocal tachycardia (RT) is also known as paroxysmal atrioventricular nodal reciprocal tachycardia. Under this long definition, the disease is included in ICD-10, where it can be found by font I49.8 Other refined heart rhythm disturbances. Among all supraventricular (atrial tachycardia), without taking fibrillation into account, RT is present in 85% of cases. Women are ill more often than men, with all age groups without exception. The pathology occurs due to the functional separation of the AV node into several channels, each of which has its electrophysiological characteristics. On a single channel, the pulses pass faster, otherwise - slower. Due to the difference in electrophysiological properties, conditions for re-entry of the excitation wave (re-enter) and formation of tachycardia are created. There is an atrial extrasystole. The impulse blockade in the "fast" channel is formed. Through the "slow" channel impulses are transmitted to the ventricles. The "fast" channel restores the ability to excite. The pulse is retransmitted to the "fast" channel and again to "slow". The described description of wave formation re-entry is characteristic for a typical form of RT. In some cases, atypical variants are formed when the circulation passes either in the opposite direction, or the reverse pulse follows the "slow" channel. Such mechanisms of re-entry development were the basis for the classification of reciprocal tachycardia. In order for a reciprocal tachycardia to occur, there must be extrasystoles and a critical correlation between the duration of the refractory period of the intrinsic channels and the rate of transfer of impulses. The heart rate at RT is relatively small - 140-250 per minute. The presence of symptoms of autonomic disorders depends on the emotionality of the patient. Concomitant diseases of the cardiovascular system make the clinical picture prognostically unfavorable. There are several groups of etiological factors contributing to the development of reciprocal tachycardia. Congenital This includes hereditary predisposition to various types of tachycardia, as well as Wolf-Parkinson-White syndrome. 2. Acquired. The group consists mainly of diseases that arose throughout life and stimulate the appearance of pathological tachycardia. There are provocative factors that increase the risk of developing TB. This is mainly alcohol abuse, psycho-emotional over-tension and excessive physical activity. It was noted above that the mechanisms of reciprocal tachycardia development formed the basis for the classification of pathology. A typical form, or slow-fast (slow-fast) - during the circulation of the excitation wave, its anterograde passage through the "slow" canal occurs. Retrograde movement is carried out through the "fast" channel. Atypical form. In turn, divide into two types. The first one is called fast-slow and represents a re-entree in the opposite direction. The second is slow-slow, during the retrograde movement the wave passes through the "slow" channel. an atypical RT appears in the form of a retrograde wave that enters the ventricular complex, which is referred to as a tachycardia with a long interval of RP. Additionally, instrumental studies are conducted to determine the condition of the cardiovascular system, to identify the root cause of the pathological condition. 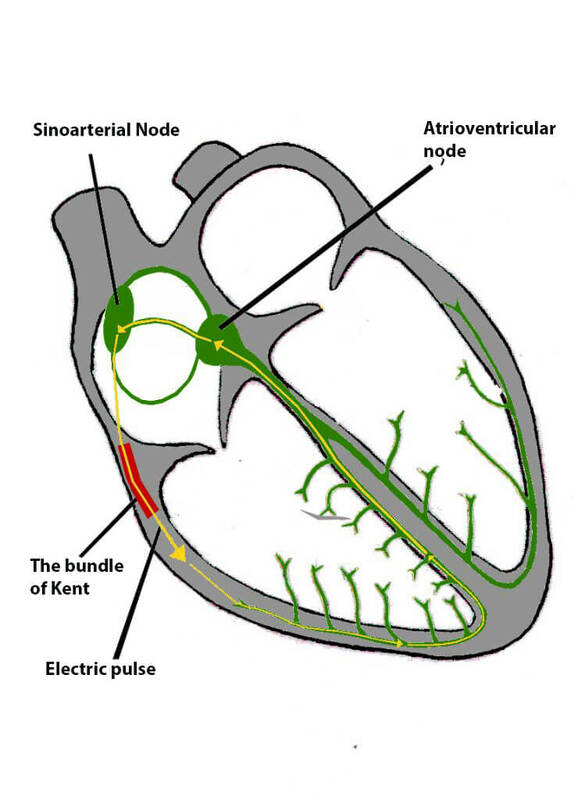 In particular, transesophageal electrophysiological study, endocardial electrophysiological study is used. It begins with the general measures of assistance: open access to fresh air, a tranquil setting. Further vagal tests are conducted (call of vomiting reflex, massage of carotid region, sample Valsalva). Lack of effect from the actions leads to the implementation of pacemaker and medication therapy. Trans-esophageal pacing is performed by means of a volley scanning ECS. If a patient has low blood pressure, this is not a contraindication to manipulation. The result of the ECS is observed in 90% of cases. Triphasadenine is administered intravenously, with no effect, re-administration in double dose. The drug manages to stop the attack in 90% of cases. Verapamil is administered intravenously, the effect of its administration is observed in 95% of cases in about half an hour. Other drugs of choice are obidin, novocainamide, adenosine. In the case of ineffectiveness of medication therapy, surgical intervention is used. Radiofrequency ablation is widely practiced today, which helps to get rid of reciprocal tachycardia at 97% during the first session and 100% in the second.According to arrhythmologists, complications after RFA are practically absent. The ablation is shown to all without exception by patients who suffer from reciprocal tachycardia. Of all possible contraindications, the only thing noted is the patient's preference for further treatment with antiarrhythmic drugs. During RFA, the "slow" channel fibers are broken down. There are certain criteria for evaluating the effectiveness of the operation. First, when applying the application, the rhythm of the atrioventricular compound is accelerated. Secondly, the "jump" disappears with a hair dryer, which is detected in 70% of patients with reciprocal tachycardia. Thirdly, the pathology does not manifest itself when it is intentionally stimulated. Conducted in case of frequent recurrence of reciprocal tachycardia. Antiarrhythmic drugs are prescribed, which are often taken for a long time. If the patient has no organic heart lesions then one of these drugs, such as quinidine, disopyramide, novocainamide, is selected. The presence of cardiovascular pathologies leads to the intake of other drugs: beta-blockers, sotalol, cordarone, verapamil. Preference is often given to the drug that has previously been able to stop the attack of reciprocal tachycardia.